Nearly 16% of the front page of the New York Times on Thursday was devoted to the story of a woman who evidently has been posing deceptively as a survivor of the attack on the World Trade Center. By the looks of it, the tale of Tania Head appears to be the story of a troubled woman who created a dramatic alternative to an otherwise prosaic, if not sad, life. But the Times' double-barrel expose of her evident deceit seems to abandon its usual standards of balance and decency. After sending no less than three reporters after Tania, the Times started the story on page one with a two-column color picture and then jumped it onto two-thirds of an inside page with two additional pictures. Tania, who until this week had been the unpaid president of a 9/11 victim-support group, said she was a Merrill Lynch executive who suffered burns while on the 78th floor of the south tower when a hijacked plane hit. She was escorted to safety by a Good Samaritan who perished himself in the tower collapse – but not before being given the wedding ring of a mortally burned man who asked that she return it to his wife. As she recuperated days later, she learned her fiancé died in the collapse of the other tower. If Tania is a private individual who has done nothing dangerous, self-enriching or illegal, was it appropriate for the New York Times to go off on her the way it did? How was the community served by exposing so harshly an individual whose fabrications suggest – to this armchair psychologist, anyway – that she is emotionally troubled? My guess is that this will be a significant setback to a person who, most likely, was in a pretty fragile mental state even before the Times outed her on page one. Journalists have an abundance of opportunities to write about nutty people all the time, even during non-election years. But they owe it to their readers, if not to themselves as ethical individuals, to choose wisely about whom to pursue and how hard to hit them. If the Times felt, upon due consideration, that it was the best use of its resources to go after Tania – instead of all the other stories it could have pursued this month – then a short story on an inside page should have been sufficient to do the job. When a powerful newspaper like the Times bashes gnats with a sledgehammer, it looks like a bully. And nobody likes a bully. The following email from a disheartened former newspaper publisher is the most candid and sobering reaction I got to my post on what the traditional media companies must do to respond to the challenges posed by future technological changes. I don’t subscribe to the newspaper my family sold to a chain in the mid-1990s. While I miss the New York Times crossword puzzle, I finally stopped my subscription, because I really wasn’t interested in reading the generic news that has replaced the community coverage we used to provide. In more than 30 years of newspaper management, I experienced the transformation described in your white paper on Media 3.0, as we faced increasing competition from direct mail, segmented cable and the myriad of other choices served to advertisers. But there is one underlying reason why newspapers will not be able to take advantage of the opportunities so well presented in your paper: They simply lack the intellectual capacity. In the past, they’ve fumbled every opportunity to harness their resources and address the opportunities. There is no empirical evidence that they have changed their ways in the last 15 or 20 years. In the early 1990s, our newspaper partnered with a small Internet company and began offering our classified ads online. As you can imagine, it was archaic by today’s standards, but it was welcomed by early adopters. A small management team was established to meet with other suburban newspapers in our market to ascertain their interest in aggregating all of our classified ads and offering a market-wide buy. I’ll always remember the meeting, because the publishers from the other newspapers looked at us as if we were aliens from some other planet. Simply put, they didn’t get it. One of the publishers present at that meeting is now a top executive of the same chain that bought our paper! While newspapers continue to experience positive cash flow, the current model, as you well know, is imploding. Furthermore, I would question your assertion that they continue to enjoy large audiences. When we sold our newspaper in 1996, circulation was in excess of 40,000. Today ABC figures indicate that paid circulation is somewhere in the neighborhood of 21,000. Factor in NIE copies given away for free to schools; 24/7 rack sales, gimmicky aggregation (adding a paid weekly as one-seventh “daily” circulation), and offering subscriptions for less than $20 per year and you can extrapolate the real readership as much less than claimed. I also question the industry’s marketing capability and its commitment to content-creation resources. In regard to the latter, market forces are redirecting content providers away from newspapers. One only has to look at the pay scale of entry-level reporters to see why qualified journalists are shunning newspapers. Our family sold our newspaper to the chain, because we were wall-to-wall union; the unions were intransigent and we could not see how we could compete with the lower-cost media competing for the same business. I knew the chain could “get the deal done” when it came to reducing costs. Parenthetically, my family doesn’t miss the death threats I received from disgruntled union activists when we attempted on our own to reduce force (legally, through the contracts, I might add). Threats aside, cost-cutting is no particular challenge. It’s easy to reduce the workforce, trim back on the roll width, cut outlying circulation, and so forth. I did it several times and I didn’t find it intellectually taxing. The challenge is to make the transition to thinking about content, not newspapers. Over the years, I have served on several non-profit boards. During a meeting yesterday, a marketing consultant mentioned that traditional media wasn’t driving traffic. . . advertising was placed in all local newspapers but results were disappointing. He suggested to the board that traditional media be cut back and that dollars should be allocated to online venues. Now, I don’t read my old paper, either. When the boiler-room crew calls to attempt to lure me back by offering a full year’s subscription for $15.99, I respond by saying that’s still too much for what their product has become. If I don’t read the paper, who will? You can get a copy of the white paper mentioned in the above article via email. Don't forget to change the [at] to @. Media executives struggling to wrap their minds around Web 2.0 may be distressed to know they ain’t seen nothin’ yet. Several media kibitzers, including yours truly, believe Web 2.0 is merely a transitional stage on the way to a new era I cleverly call Media 3.0. I use the term “Media 3.0,” as opposed to “Web 3.0,” because the term is technologically agnostic and the web, imposing as it is today, could be supplanted some day by a new technology as radically different as HTML was to hot metal. Media 3.0 will turn absolutely upside-down the classic one-to-many model of Media 1.0, replacing it with a many-to-one paradigm in which news, entertainment and advertising are delivered in a uniquely individualized fashion to all but the most technologically recalcitrant consumers. The paradigm shift will be enabled by significant future technology developments in such areas as artificial-intelligence software, database systems, media-compression algorithms, network architecture, mobile platforms and nanotechnologies capable of delivering vast computing power to more diverse and tiny platforms than we can imagine today. :: Media companies can succeed in the future only by enabling their content, as well as any associated advertising, to be acquired on an individualized, ad-hoc basis by consumers. :: As the large and “sticky” audiences traditionally enjoyed by Media 1.0 companies continue to fragment, they will become increasingly devalued in the eyes of most advertisers. Media companies must develop sophisticated systems to marry targeted commercial messages with content wherever and whenever it is consumed. :: Mass-market advertising, which already is in the process of being supplanted by targeted and verifiable keyword advertising, will migrate to contextual systems that deliver precisely tuned messages to individuals on the verge of ordering a pizza, buying a car or booking a vacation. You may be shocked to hear that not everyone happens to agree with me. Nova’s commentary goes on to get more technical from there. Even if you don’t know your OWL from your GRDDL, the point is that big changes in technology in the next decade are going to cause even more disruptive changes in the media business than anything we have seen to date. The traditional media companies were completely blind-sided by the web and its associated implications. Though their historic market dominance has been weakened today by the continuing onslaught of new media companies ranging from Market Watch to iTunes to You Tube, the old media remain big and healthy enough to architect, fund and implement the sort of cutting-edge initiatives that could enable them to survive in the Media 3.0 era. This is their best chance to get it right. But also their last. Newspaper publishers who partnered with Yahoo are seeing such significant online sales increases that they could start producing positive over-all revenue gains as early as 2009, says one Wall Street analyst. That would be a welcome change for an industry that has endured six straight quarters of accelerating revenue erosion and appears to be headed to its worst annual print sales in a decade. Given the early positive online sales performance of the newspapers collaborating with Yahoo, “we believe this deal could move ahead by a year or more the inflection point where online revenue gains offset print declines,” says Paul. He is so enthused by what he sees that he is urging clients to buy shares of Lee, the only newspaper publisher to date that has embraced the full range of Yahoo partnership possibilities. Lee's reward has been a 56.2% leap through August in year-over-year interactive sales. Sorry, folks, Lee is the only “buy” on Paul's list. Yahoo struck a deal earlier this year to sell online advertising in partnership with such publishers as Belo, Hearst, Media General and Media News. Biggies like Dow Jones, Gannett, the New York Times Co. and Tribune, who have separate online initiatives of their own, did not join the consortium. And McClatchy, whose online sales have fizzled this year, elected to participate in some parts of the joint venture but not others. The first and most prominent manifestation of the Yahoo-newspaper venture was an agreement to have newspapers promote and sell advertising for HotJobs, the Yahoo online recruitment site. The ambitious deal also extends to cross-selling local ads, national banners and keywords in search results. Thus, as I wrote earlier, Yahoo locked up “the largest, most experienced and best-connected local sales force in every market participating in the program.” As the busiest web site on the planet, Yahoo contributes a high profile, billions of page views and a technological astuteness that has eluded most newspapers. Pointing to the early success achieved by Lee and other Yahoo affiliates, Paul sees four benefits to newspapers from the Yahoo partnership: more online ad inventory, more website traffic, higher ad rates and a welcome share of the revenues Yahoo generates by selling national ads to run on local newspaper sites. With Yahoo's help, says Paul, banner-ad revenue, which he calls the long-time “poor step-sister” of classified advertising, could grow by as much as 50% this year at participating papers – and soar at still higher percentages in 2008 and 2009. He believes sales from HotJobs and other Yahoo classified products could more than double to 11.6% in 2008 from 5.1% in 2007. Throw in a bit of new search revenue, and the consolidated online sales at Paul's prototypical newspaper could leap 40% annually (or better) between 2008 and 2010, he says. That would surpass the industry's average online sales growth of 20.8% in the first six months of 2007, which happens to be two-thirds the rate sales grew in the first half of each of the prior three years. After two or three years of 40+% online sales growth, says Paul, interactive revenues would become sufficiently large at newspapers to offset the anticipated continuing decline in print ad sales. If it all comes together as Paul predicts, at least some publishers could be posting positive over-all sales gains as soon as 2009. Paul’s encouraging hypothesis implicitly assumes there will be no major shocks to the economy and that no new disruptive forces will emerge to vector advertising dollars away from the print and online media traditionally sold by the newspapers and Yahoo. Given a two-year weakness in auto advertising, the deteriorating real estate market and the questionable future strength of help-wanted advertising, you can see how things might not materialize as smoothly as Paul would have it. Online advertising sales have fizzled completely this year at McClatchy, the nation’s second-largest newspaper publisher. The question is: Why? Although online sales at newspapers grew far more vigorously in the last three years than they have in first half of 2007, interactive revenues remain the single positive note for an industry heading to a likely 10-year low in print sales. But McClatchy, whose print sales are wilting along with those of most of its peers, isn’t even sharing in the online upside. So, why is McClatchy’s online sales performance drastically lower than that of the rest of the industry? “There’s never a quick and easy answer to this sort of stuff,” says Elaine Lintecum, the company’s treasurer. Agreed. But McClatchy’s answers are neither quick, nor easy, nor convincing. Now that I hereby have reminded you that I own a paltry number of shares of the company’s stock, here’s a point-by-point summary of what McClatchy has to say about its fizzling online sales – plus my take on why it doesn’t quite compute. “Our online sales continue growing, even though our accounting numbers appear to be less favorable,” says Elaine, arguing that it is difficult for McClatchy to make year-to-year sales comparisons for the 20 newspapers acquired from Knight Ridder in mid-2006 because McClatchy’s accountants can’t reconcile KRI's bookkeeping to their system. My take: McClatchy has owned the former KRI papers for a full year as of June 27, 2007, so the company, at the very least, ought to have accurate year-to-year comparisons for the months of July and August. Those numbers show online sales rose 8.4% in July (vs. +62.5% for Lee) and dropped 3.1% in August (vs. +48% for Lee). With McClatchy now counting all the beans, there can be no doubt that its online sales are far worse than those of any of the publicly held publishers. When McClatchy bought KRI a year ago, Tribune Co. and Gannett gained the right to buy back the one-third share of the three-way partnership they had forged with KRI to create Career Builder, the online job site. After prolonged negotiations, McClatchy cut a deal with the other two publishers to sell 18.3% of Career Builder to TRB and GCI and to retain the rest for itself. A less-celebrated provision of the deal took certain lucrative Career Builder products away from the former KRI papers in the McClatchy fold. The absence of those advertising products is another reason for McClatchy’s online sales slump, says Elaine. But it gets worse: Not only did Career Builder take away the valuable products that are costing McClatchy revenues, but Career Builder now is also selling some of them directly against the former KRI papers. My take: Why did McClatchy go along with a deal that turned its partner, Career Builder, into a direct competitor? Chris Hendricks, the vice president of interactive media for McClatchy, told investors over the summer that he was trying to persuade Career Builder to give him a better deal. When asked if he made any progress, Elaine said via email: "We do have some additional products we can now sell. That is all we can say." You can bet Career Builder will be selling the same stuff, too, diluting McClatchy's share of a recruitment market likely to shrink in the expected economic slowdown. Elaine says it will take 12 more months before the above issues are wrung out of the financial statements, thus producing accurate year-to-year comparisons that will prove, retrospectively, that McClatchy’s online sales are growing faster today than the financials would appear to suggest. My take: Unless the company is fudging its numbers – which I don’t for a second think is the case – how can sales be growing faster than the company’s financials say they are? The numbers are weak, because the numbers are weak – not because they are being counted wrong. So, what's happening here? Why are McClatchy's online sales the lowest, by far, in the business? If McClatchy knows, no one is telling. If McClatchy doesn't know, that's telling, too. Congrats to the judge who booted Par Ridder, the ethically challenged publishing scion who has besmirched the good name of the struggling Minneapolis Star Tribune for the better part of a year. When I first suggested in June that Par do the right thing and resign, I said “he has flunked most of the major tests of modern corporate stewardship.” By stubbornly sticking around to embroil the newspaper in three additional months of nasty, costly, embarrassing and distracting litigation, I would say Par at this point has flunked all the major tests of modern corporate stewardship. Now that Judge David C. Higgs has barred Par from serving as publisher of the Strib for a year, let’s hope Par – and the investors who put him there – have the good sense to make it permanent. Google is road-testing a major initiative capable of hijacking a good deal of the web traffic the mainstream media ordinarily would get during the 2008 election in the United States. Fortunately for the MSM, Google’s ambitious new online publishing project went on public view last week in Australia. So, American newspapers interested in preserving as much of their flat-lining web traffic as possible should waste no time in taking a look at Australia Votes, the up-and-coming way of presenting the political news from Down Under. Australia Votes signals a significant strategic shift on the part of Google to become a primary web destination, as opposed to restricting itself to its historic role as a supplemental, though highly valuable, research tool. As such, it eventually could compete head to head with not only the likes of CNN, the Washington Post and all the other media biggies but also with the tiniest of tiny weeklies. If you don’t think the mainstream media are vulnerable to Google’s greater growth, look at the data. 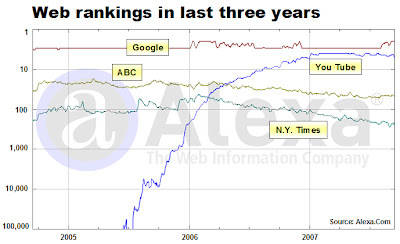 As you can see in the graph below from Alexa.Com, Google and its new subsidiary, You Tube – respectively the third and fourth busiest sites on the Internet – have been gobbling market share over the last three years at the expense of the mainstream media (and, of course, certain other competitors, too). The combined traffic of Google and You Tube would lift them well above Yahoo and Microsoft, the top two sites. Meanwhile, ABC, the highest-ranking MSM site, has dropped to No. 48 today from a position in the 20s three years ago. And the New York Times, the highest-ranking newspaper site, has fallen to 209 today from the top 50 in the early part of 2006. The Google election project, an elegant mashup of Google’s arsenal of search, mapping, video, widget and other technologies, is a preview of how all but the most technologically recalcitrant consumers will expect to get political – and many other types of – news in the future. In addition to delivering a wealth of well-packaged election information and interactive tools, Google has created four content-pushing widgets and a number of ways for users to express their opinions via forums and home-brewed video. Australia Votes – and the all but certain sequel, America Votes – demonstrates emphatically the lopsided competitive advantage Google (and similar but less formidable web publishers) has over the traditional media companies. While the MSM bear the enormous costs of producing content and delivering it via capital-intensive print or broadcast infrastructures, Google (a) pays nothing for the content it scours off MSM web sites, (b) incurs essentially no costs in selling advertising and (c) spends a trivial percentage of its more than $13 billion in annual sales on the 24/7 data centers that require human intervention only when they go awry. Although Google is brilliant at finding, aggregating, indexing and rapidly presenting the collective wit and wisdom of the web, dozens of libraries worth of books and a growing array of public documents, Australia Votes, like all Google products, contains zero original content produced by Google, if you don’t count the promotional video. Instead, Google is populating Australia Votes with original content provided for free by the mainstream media companies whose lunch, as previously reported here, it already has begun to eat. Now or in the future, Google can make money off the large and expanding audience of sites like Australia Votes by selling advertising to marketers who use a totally automated, self-service system that gives them immense control over their buys and the instant gratification of minutely tracking the success of their campaigns. What Google does not have is the sort of large, highly compensated sales staff that is employed by every newspaper, magazine and broadcast outlet in the country (save for public broadcasters, who rely on the support of listeners and viewers like you). Unlike the humans creating content, selling ads and producing products at the legacy media companies, Google's massive computer arrays do not require lunch breaks, sleep, vacations or union representation. To be clear: I’m not against lunch, sleep, vacations or union representation, each of which I have enjoyed to a greater or lesser extent in the course of my career. But Google’s boldest-yet intrusion into the formerly sacred space of the MSM underscores the urgent need for legacy operators to cut their embedded costs to be able to compete in the future with Australia Votes and the many similar initiatives surely coming down the line. Among other efforts, the MSM need to take a page from Google by learning to publish efficient, compelling and customizable database-driven sites like Australia Votes or Chicago Crime. And they need to emulate the frictionless online advertising platform that fuels Google’s high-margin success. And here’s one more out-of-the-box idea: The MSM may want to start thinking about charging Google for their valuable content before they discover they can’t afford to produce it any more. UPDATE 9/17/07: The cautionary note in the above paragraph goes double for the New York Times, which announced today that it will stop charging for access to its premier columnists. The decision sort of makes sense, given the steady deterioration in the newspaper's web traffic since Times Select launched two years ago this month (see graph below). While this decision may arrest the declining ratings of the Times web site and create a decent number of new premium advertising opportunities, the comparatively small amount of fresh ad revenue generated by this decision will not sustain over the long term the formidable expense of generating the content for which the Times is rightfully admired. Accordingly, the Times and the other MSM need to work harder than ever to cost-effectively produce engaging new-media content to compete with initiatives like Australia Votes that threaten to take ever-more-meaningful chunks out of the mainstream media business. Silly me. I always figured I would back Barack or Hillary in the upcoming presidential election. But it turns out I’m really a Rudy man, according to a new online quiz at It’s My News, which identifies your perfect candidate after you answer 25 multiple-choice questions about everything from gay marriage to Iraq to the national debt. Although an online quiz to determine your vote for the next leader of the free world might sound goofy, games like this are well worth the attention of news organizations struggling to preserve their audience, revenues and relevance, says Michael P. Smith, the executive director of the Media Management Center of Northwestern University. “By the year 2020, 71% of the population will have grown up consuming games,” says Mike, who is conducting research into how the characteristics of popular games can be leveraged to make hard news and other serious information more compelling to more users. It stands to reason, he says, that lifelong Doom aficionados may be happier assimilating information from games than from inverted pyramids. If you’re inclined to dismiss Mike’s idea as a dubious academic abstraction, Jeff Mignon, the creator of the presidential quiz that detected my previously un-discernable Rudy yen, can give you 3 million reasons to reconsider. Before launching the U.S. president-picking quiz called It’s My Candidate’08, he created a similar game for the recent election in France. In little more than three months, says Jeff, more than 3 million Frenchpersons took the presidential quiz. Games are another of the major forces disrupting conventional media consumption, says Mike. “Young men today are more likely to play video games than watch TV,” he says. And he points to the case of legendary Penn State coach Joe Paterno, who turned his faltering football team into a winning club by turning his playbook into a PlayStation game. Although men are inclined to play shooting games and women like environments where they can build communities, collect tokens or trade information, most popular platforms share five characteristics, says Mike. To the degree serious information is packaged in game-like fashion, there is a possibility, he says, that more of it could get consumed. :: Collectibility. Competitive games give winners the opportunity to collect weaponry or other virtual products (called “tokens” in the game-o-sphere) that they either can keep to elevate their status or barter with other members of the community. MySpace, Facebook and LinkedIn owe a good deal of their popularity to the ability of users to assert their importance by collecting new friends. :: Points. In addition to c0llecting virtual stuff, games and other popular online sites make it possible for participants to give and get points that establish the status of the participant. Flickr, YouTube and Digg, while not expressly positioned as games, invite users to rank content, encouraging providers and users alike to give their all. Amazon and eBay evoke game-like characteristics by, respectively, inviting users to review books or rate vendors. :: Feedback. Successful game sites enable participants to give and get feedback, fostering a sense of involvement and community. Many of the most successful online video games encourage players to kibitz with one another in real time. :: Customization. Whether it is building a stylized, individual gladiator or coloring your fluffy avatar at Club Penguin, popular games build engagement and stickiness by enabling users to customize their experiences. This dimension is a major factor in the success of the anything-goes-environment at MySpace. Picking up on several of these cues, the Washington Post has created a liberal/conservative quiz for Facebook called Compass, which enables you to determine your appropriate spot on the political spectrum. When your friends play the game, too, your relative political beliefs are displayed in a graphic that enables you to determine who is more liberal (or conservative) than thou. If this sort of thing is good enough for the Washington Post, a paragon of journalistic sensibility, then maybe It’s My Candidate is on to something in asserting that Rudy is really my guy. Before changing my registration, though, I thought I would test the reliability of the algorithm by answering “none of the above” to every question on the quiz. This promptly produced a recommendation for Mike Gravel, whoever he is. And Mike Gravel, whoever he is, certainly ranks as none of the above. While newspaper publishers boast about how rapidly their online sales are growing, the fact is that new media revenues in the first half of 2007 grew at only two-thirds the pace achieved in each of the prior three years. To be perfectly clear: Online sales climbed at the robust clip of 20.8% in the first six months of this year to an all-time high of slightly more than $1.5 billion. Sales in the same period a year ago were a bit less than $1.3 billion. Although it sounds nutty to worry about growth like this, you have be concerned when you put those numbers in the context of the industry’s performance in prior years. In fact, online sales in the first half of each of the years 2004, 2005 and 2006 averaged 32.8%, according statistics provided by the Newspaper Association of America. So, a growth of “only” 20.8% this year is two-thirds of the historical run rate. While 20.8% growth is way healthy, another cause for concern is the speed at which growth has declerated since the end of last year. 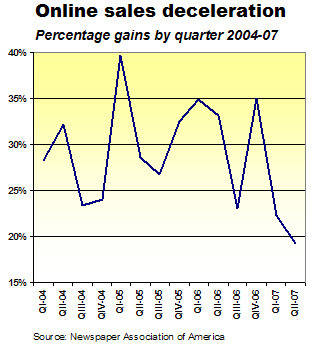 As you can see from the graph below, online sales growth dropped from 35% in the fourth quarter of 2006 to 22% in the first quarter of this year to 19% in the second quarter of this year. This could be a more extreme example of the zigzag pattern of sales growth demonstrated in the earlier years. If so, no worries. If not, then the abrupt sales decline in the first half of this year could be the precursor of an alarming new trend for an industry that counts on new media as the single ray of hope in an otherwise dismal outlook. As reported here and here, print sales for newspapers (which represent 97% of industry revenues) appear to be headed this year to a 10-year low of $43 billion. A deep and sustained drop in online sales would blow a hole in the economic assumptions upon which most publishers run their businesses. And it would blow a major hole in the upbeat story publishers have been trying to sell the Wall Street skeptics who have been battering their shares. What’s behind the deceleration in online sales? One simple (and comforting) answer is that it is easier to achieve large sales gains off a small base than a large one. If I sold $100 worth of ads last year and sold $133 of ads this year, the sales gain would be 33%. If I sold $1,000 of ads last year and tripled ad sales this year to $100, the gain would be only 10%. A less-benign cause, however, could be the slowdown in online traffic at most newspaper web sites that was reported recently by the Shorenstein Center at Harvard University. As discussed here, traffic has been flat for a year at most newspaper web sites, save for 10% gains at each of the sites operated by the New York Times, Washington Post and USA Today. Other potential factors: Ever-greater competition from online venues ranging from Google to Facebook and/or an over-all decline in ad spending related to the housing slowdown, accompanying credit crunch and fears among marketers that consumers won’t be buying as many iPhones, cars or refrigerators as they might have a year ago. If online traffic and sales indeed are declining at an acclerating pace, then the pressure will be greater than ever on the industry to find compelling new digital products to replace the prevailing practice of shoveling yesterday’s news onto tomorrow’s web site. In the event online sales do bounce back to quarterly advances of 35% or more, publishers still would be well advised to spend some extra cash on developing a few fresh ideas. Google quietly has taken a major step to further marginalize banner advertising, the molting golden goose that generates a hefty portion of online revenues for mainstream media companies. In a blog item posted on the eve of the Labor Day weekend, the Silicon Valley behemoth announced that it effectively will start diverting traffic away from the sites of the publishers and broadcasters whose businesses depend, to a consequential degree, on selling ads on the pages viewed by the visitors vectored to them by Google News. This will happen because Google News henceforth will link directly to the sites of the Associated Press, Agence France-Presse, UK Press Association and the Canadian Press, thus bypassing the sites of the publications and broadcast outlets that publish stories from the four major news services. The problem, of course, is that most news organizations have been cutting back on original content to shore up their eroding profit margins. Instead of creating the original content that Google – and the rest of us – value, the mainstream media have been filling a growing amount of the infinitely expanding space on their web sites with stories and video snatched directly off the wires. :: Users are no longer loyal to any particular website, assuming they ever were. They are utterly agnostic about where they get their content. If Google News, Digg or Small Dead Animals has something that interests them, then that’s where they’ll go. When they are done, they will be gone. :: Marketers see banners as one of the lowest forms of advertising. Because most people tune banners out – and many of us actually block them out – they are little noted and scarcely heeded, as their puny (generally less than 1%) clickthrough rates attest. The declining faith in run-of-site banner advertising is illustrated in the graph below, which tracks the steady deterioration of average rates from upwards of $37 per thousand impressions in the early days of the Internet to $2 (or less) today for bulk, or commodity, impressions on the cheapest, bust-out sites. Higher rates, of course, are commanded by the most desirable venues, but the mid-range, where CPMs also continue to decline, is where most mainstream sites fall. The graph was based on bits and pieces of information painstakingly collected from published reports by marketing consultant Michael Bloch. His data, while admitedly anecdotal, seems to fairly calibrate the increasing disdain most advertisers have for this particular medium. The projections for 2008 and beyond are mine, reflecting my belief that advertisers in the future will forsake banner ads for the reasons discussed herein. Two major caveats to be considered in viewing the data are that (a) rates always have been and always will be all over the map and (b) media companies are notoriously and properly reluctant to disclose the actual rates they charge their customers. Even if some authoritative mega-database suddenly materialized to prove that the average CPMs today really are higher than shown here, there can be little doubt that rates are substantially lower now than when Internet advertising was the hot, new thing. Further, rates are certain to become increasingly marginal as advertisers capitalize on new technology to find better ways to identify qualified buyers at the magic moment they are planning to order a pizza, buy a car or book a vacation to Italy. The inexorable migration away from banner advertising will be paced by the speed with which the emerging smart-computing technologies enter the mainstream. Google’s decision to effectively ratchet down the number of links to media sites won’t alone kill the banner-advertising business. But it will help to hasten its demise by cutting into the page views long courted by the mainstream media to build their web sales. Newspaper publishers like Gannett, McClatchy and the by-gone Knight Ridder historically defended giving Google and others the free use of their content as a means of generating additional page views to create more advertising inventory. Now, publishers have two problems. The least of them is that Google, the mother of all search destinations, is going to be stingier about steering traffic in their direction. The bigger issue is that the page views publishers work so hard to build are becoming increasingly less valuable to their advertisers and, thus, to them. The solution for publishers is to get beyond selling passive advertising by the bellybutton in an ancient, brute-force numbers game they can no longer hope to win. Instead, publishers need to start developing individualized, transaction-oriented products that will deliver targeted, qualified leads to advertisers who will pay handsomely to reach live prospects poised to make a purchase. Publishers have to get busy to get this right. Online traffic already is showing signs of flat-lining, as discussed previously here. Ignoring the gathering threat to the banner-ad business will lead at some point to a gut-wrenching decline in online revenues similar to the one now afflicting the print side of the business. Ironically, newspaper publishers like to point to rising Internet sales (which on average still represent only 7% of their revenues) as the future salvation of their tottering franchises. If they are building their hopes on the banner-ad business, they are building on decidedly shaky ground. Given the accelerating decline in print advertising sales in the first half of this year, newspaper revenues now appear likely to fall by some $3.5 billion in 2007, not the $2 billion forecast here in May. Three months ago, I calculated that publishers would be lucky to break $44.5 billion in print sales this year, which would have made for the worst performance since the economic shock that followed the terror attacks in September, 2001. In light of the 8.3% decline in print revenue in the first half of the year, however, it now appears publishers this year will be fortunate to generate $43 billion in annual print sales, a level not seen since 1997. Assuming the revised forecast is correct, print sales for the 12 months would be 8% lower than the $46.6 billion achieved in 2006. 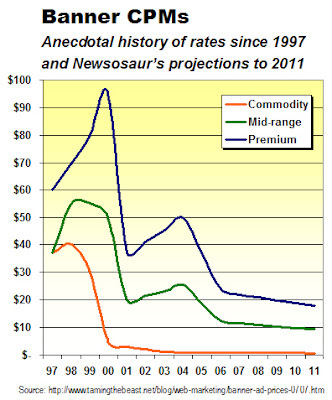 Lest we forget, print revenues in 2006 were 3.7% lower than in the prior year. Thus, the rate of decline would have doubled in a year’s time. The projection is based on a simple calculation that assumes approximately 47% of industry sales will be produced in the first half of the year and the balance will be arrive in the remaining six months. Sales have been distributed in this pattern for years, making the formula a reliable indicator under ordinary circumstances. The question is whether these are ordinary times. With the rate of decline in newspaper sales gaining momentum from one quarter to the next for the last 1½ years, there appears to be nothing in prospect to arrest the deterioration. Continuing sales deceleration would lead to even lower sales for the year. The jitters in the housing market this year already put real estate classifieds in a free fall before the sub-prime mortgage crisis hit at mid-year. Auto advertising has been eroding steadily since 2003. Employment, which has lost $4 billion in sales since 2000, has been migrating steadily to Craig’s List and Monster. If retailers fear consumers are likely to moderate their purchases during the upcming holiday season, they will trim their already shrking schedules. As if these fundamentals were not sufficient cause for concern, there also is emerging anecdotal evidence to suggest the historic declines themselves are causing advertisers to think twice about sustaining even their slimmed-down newspaper advertising budgets. Publishers and industry analysts say advertisers are pointing to slumping sales as evidence that newspapers are an unfashionable, inefficient, archaic, and, therefore, undesirable medium. Put it all together and it is possible that the depressing first half of this year could turn out to be the best half of this year. In that case, the estimate of $43 billion in print sales could be too optimistic. We’ll let you know in a few months.